The Boston Patriots were the AFC East's bottom-dwelling mainstay for the first half of the 1970's. Before Eason, Bledsoe, and Brady there was Steve Grogan, a tall, gangly quarterback out of Kansas State. And although Grogan was never a Pro Bowl-caliber passer, he did scramble and hand the ball off enough for New England to set an NFL team record with over 3,100 rushing yards in 1978. 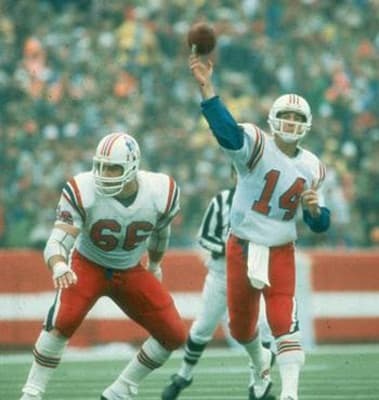 On New Year's Eve 1978, the Patriots hosted their first-ever playoff game, a loss to the Houston Oilers. The season marked a breakthrough for the franchise and established the Patriots for the first time in the NFL.